The name says it all: the new Kettler modular wall bars offers the possibility to upgrade the wall bars according to your needs. Even without any attachments, the wall bars of Kettler is already a very functional training equipment and makes a diversified, effective whole body training possible. Extend your classic wallbars to a multi-gym for own-weight exercises with the NOHrD Multi-adapter for wallbars. The adapter can be hinged in the wallbars in two ways. 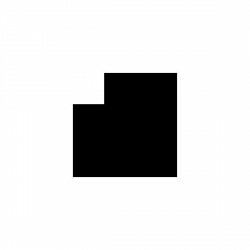 Either with two bars standing forwards or as bar parallel to the wallbars. The exercise variety is distinctively enriched with the NOHrD Multi-adapter for wallbars. The Wallbarz gymnastics set Woodsy are sturdy wall bars with many playing and exercising possibilities for children from the age of three. Modern design, natural materials as well as countless playing possibilities characterise the gymnastics set Woodsy. 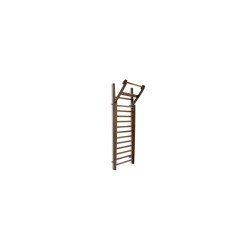 The Wallbarz gymnastics set Woodsy is easy to mount and offers two types of mounting. The Wallbarz Fitness wall bars is a compact, multi-functional training equipment for the use at home. Achieve good results in muscle building and in losing weight with the training with the wall bars of Wallbarz. The Wallbarz Fitness wall bars offers two possibilities of mounting: by spreading between ceiling and floor or by wall mounting. 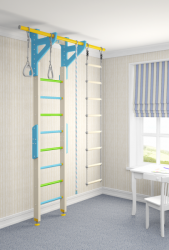 The Wall bars with round bars of Sportgeräte Langer is a versatile fitness equipment for gymnastics and strength training at home. The first bar is in front and the wall bars has a space. 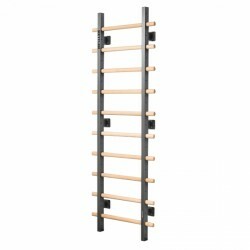 The Wall bars with oval bars of Sportgeräte Langer is a versatile fitness equipment for gymnastics and strength training exercises at home. The chin-up bracket is just hooked in on top of the wall bars. It is the perfect wall bars accessory for exercising the torso. The NOHrD wallbars of precious walnut version is of top class among gymnastics equipment and convinces by its high-quality workmanship and versatile training possibilities. The NOHrD Wallbar walnut is a well-thought out and elegant development of the approved wallbar. Being equiped with an additionally foldable arm, you can accomplish even more different exercises with the NOHrD Wallbar walnut. A sports equipment classic of exciting design and even more workout possibilities. The NOHrD Wallbar Clubsport not only comes in an exceptional design but also provides excellent training options. The NOHrD Wallbar Clubsport blends in like a piece of furniture and features a fold-out top arm so that the user can perform a great variety of exercises to improve strength and flexibility. I'm not going to comment on the equipment just yet as it's in the box waiting for assembly but I should comment on the wonderful service I received from Sport-Tiedje (I was assisted by Jennifer Wegner). I was unavailable for home delivery due to a personal circumstance and Sport-Tiedje (Jennifer Wegner) assisted wonderfully all the way to accommodate my request to have delivery changed. I cannot thank them enough for a prompt, professional and indeed wonderful customer service. Very impressed and will be shopping here again soon. Overall nice wallbars, I'm satisfied. Assembling was straightforward, just the pre-drilled holes on the bars were a few millimeters off, so it was hard to screw the screws in, but if was doable and the result seems to be stable. The foldable arm needs some additional security if used by children, otherwise it could open accidentally. At home or at gym: wall bars are a classic ! Everybody knows it from the gym: wall bars. The classic training wall is also very good as fitness device at home. Many exercises can be done on wall bars - ideal for fitness training at home. This includes gymnastics, stretching and simple strength exercises. As the highest bar of wall bars juts out a bit, in general, hanging exercises can be done with it. It is perfect, when you want to stretch or do something againts a tensed back. When you use the wall bars together with a sling trainer, you already have a little fitness unit for Functional Training. Simple, elegant, and enormously effective ! Wall bars adapt perfectly to the modern living environment with their elegant wood design. NOHrD Wall Bars, i.e., look as elegant as a piece of furniture with their very precious materials. Ideal for gyms and home fitness: wall bars demand only small space. It is mounted on the wall and juts only few centimeters out into the room. You just need some more space in front of the fitness equipment to do your exercises. As wall bars are made of renewable resources, it does not burden the environment. This emphasizes the natural and lasting gymnastics training on wall bars. 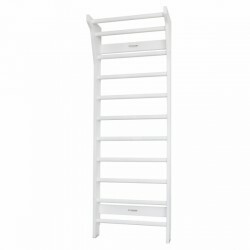 Wall bars can be excellently upgraded ! 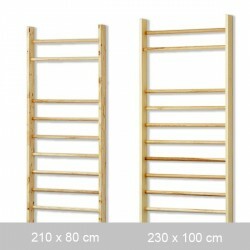 There is a lot of accessory for wall bars - for a more varied training. You can hook in an adaptor to do chin-ups or dips. This makes your fitness wall an excellent torso trainer. Furthermore, you can loop an expander or physio tubes around the bars to do light strength training exercises. When you clamp your legs behind a bar, you can use the wall bars for crunches or sit ups. In order to make these exercises more challenging, do them on an incline bench. This is available at Sport-Tiedje as separate accessory. 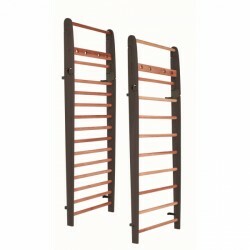 Purchasing wall bars, you get an incomparable, elegant, and easy fitness equipment for home sport.